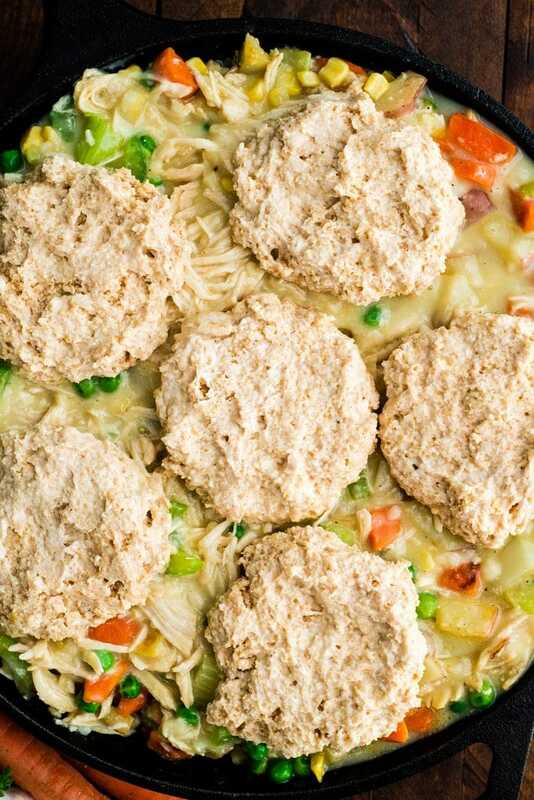 This Healthy Chicken Pot Pie Recipe is made from scratch and has a delicious whole wheat biscuit crust. It is a perfect lightened up weeknight dinner recipe that is still cozy and comforting. Are you ready for the most cozy, comforting and delicious chicken pot pie recipe EVER?! It’s true. I absolutely adore chicken pot pie. It’s so classic and nostalgic that I think everyone should have an amazing chicken pot pie recipe in their repotire. However, I love feeding my family comforting yet healthy meals, which is why I created this particular version! 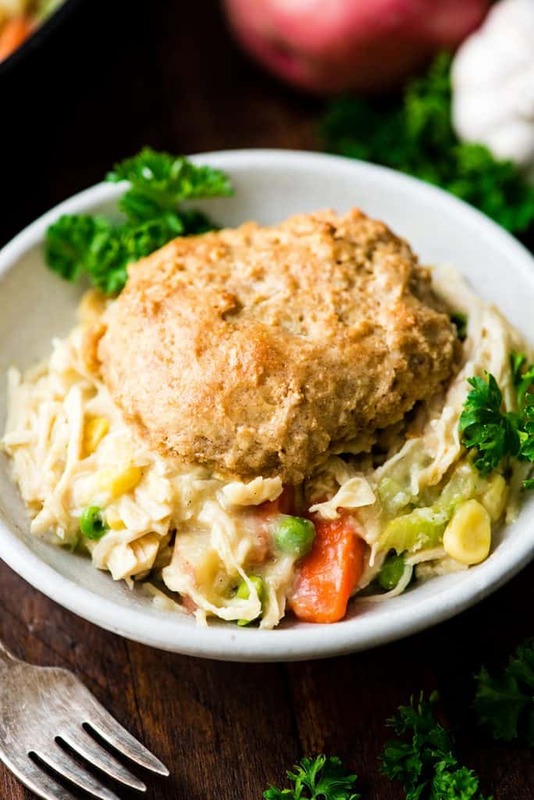 This Healthy Chicken Pot Pie Recipe is made completely from scratch (NO canned soups here)! There is only 1 TBS of butter in the entire recipe and it’s absolutely loaded with chicken and veggies. The whole wheat biscuit crust is much lighter than the traditional pie crust, but is (dare I say) even more delicious! 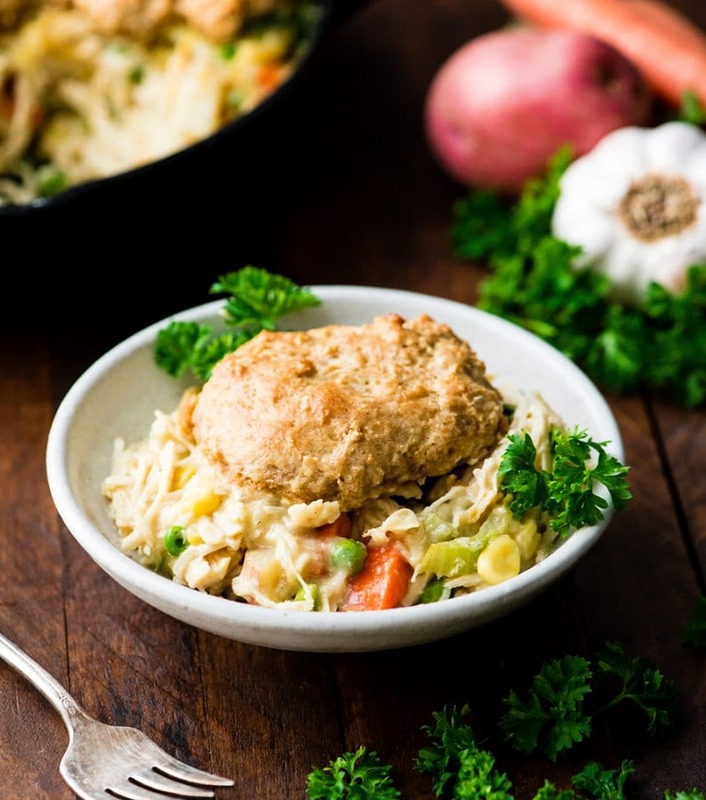 This healthy chicken pot pie is a must-make this fall! It’s a simple main dish recipe that your entire family will love! 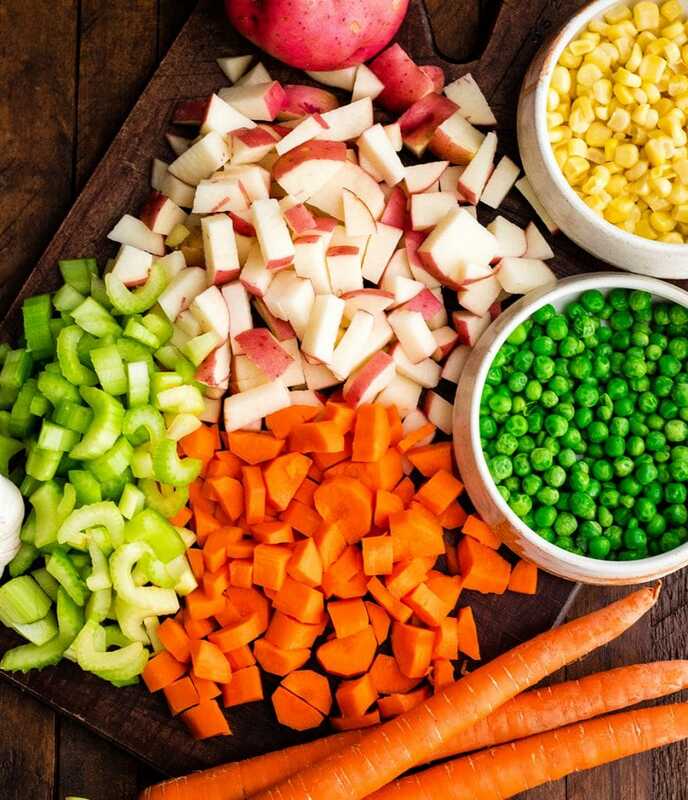 How do you make Healthy Chicken Pot Pie? Ok, if you scroll to the recipe it might seem super complicated…but I PROMISE it’s not! This is one of my favorite weeknight meals! And while there may be a few steps (it is totally from scratch), they’re all very straightforward and easy to do! There are no canned soups in this healthy chicken pot pie recipe! Which means we make the creamy sauce completely from scratch! It’s very easy to do so don’t worry! Whisk together the milk and flour. This will ensure that when it is added to the broth/spice mixture there will not be any lumps. Bring the broth and spices to a boil. If using bouillon this is important because it ensures that the base is dissolved. Add the milk/flour mixture & whisk! Make sure to whisk constantly after the milk/flour mixture is added! Cook until it begins to thicken, then remove from heat, put a lid on the pot and set the sauce aside. 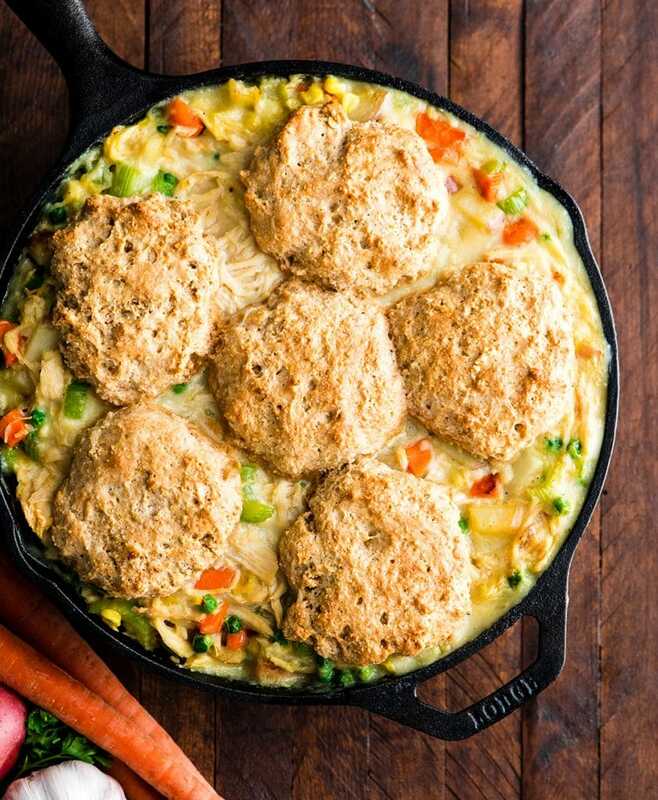 If you want to make this chicken pot pie recipe super easy, use a 10″ round cast iron skillet to cook the filling ingredients. Then you can use one pan for the rest of the recipe! Start by cooking the potatoes until they just begin to brown. Then add the rest of the hard vegetables and cook until soft. Add the peas and corn and cook until they are warmed through! This cooking process takes from 15-20 minutes, depending on how small you cut up the potatoes/veggies (smaller veggies cook faster)! Once the filling ingredients are cooked, add the sauce and stir to combine. 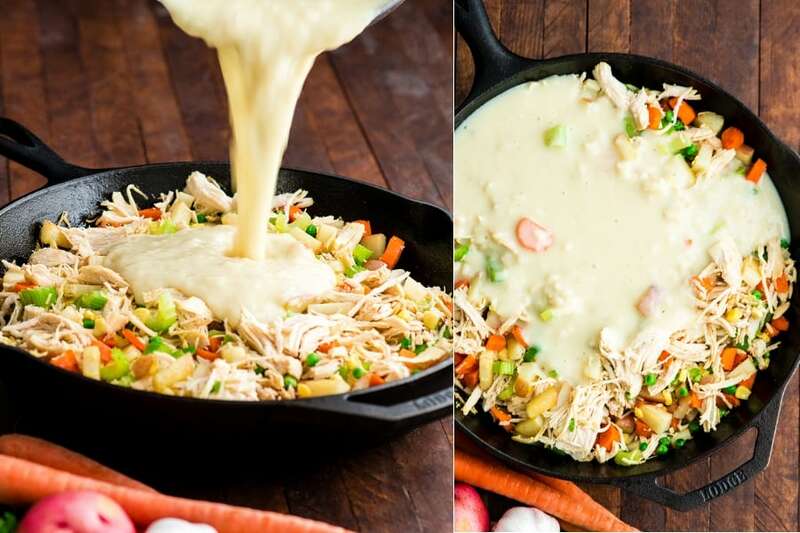 If you plan on baking this homemade chicken pot pie recipe in something other than the cast iron skillet used to cook the filling, then now is the time to transfer it to your preferred baking dish! Just be sure to cover the dish while you are making the biscuits! This keeps everything moist and lets the flavors blend! TASTE TEST! At this point I recommend tasting the filling and adjusting the seasonings (especially salt and pepper) to your liking! I absolutely adore making chicken pot pie with a biscuit crust. I think it tastes even better than regular pie crust, and it’s healthier! Plus, it’s so easy! Just one bowl and a handful of ingredietns Here are some tips on how to make the biscuits! Cut butter into dry ingredients. There’s only 1 TBS of butter in this entire recipe! Which is pretty great when it comes to chicken pot pie recipes! I use my hands to work the butter into the dry ingredient mixture until coarse crumbs form, but you can use a fork or pastry cutter if that’s more your style! Add wet ingredients. Use a spatula and mix the rest of the wet ingredients into the dry ingredients. The dough will be a little tacky/sticky, that is normal! Shape the biscuits. Use your hands to shape the biscuits into your desired size and shape. Be sure they are no more than 1/2-1″ thick! Place the biscuits on top of the filling. Once the biscuits are shaped, gently place them on top of the chicken pot pie filling in the baking dish. Continue until all the biscuit dough is used up! Once the biscuits are situated and everything is ready, put the baking dish in the preheated oven and bake until the biscuits are golden brown and the filling is bubbly. Let the healthy chicken pot pie cool on a wire rack for 5-10 minutes before serving. Then serve with a sprinkle of fresh parsley (if desired) and dig in! FAQS about Making Chicken Pot Pie from Scratch! How long does chicken pot pie last in the fridge? If you don’t eat it all in 24 hours, (which we almost always do) this healthy chicken pot pie recipe from scratch will last for 3-5 days when stored in an airtight container in the refrigerator. NOTE: the whole wheat flour in the biscuits cause the part of the biscuits that touch the filling to turn a darker brownish gray color after they have been stored in the refrigerator. That is totally normal and doesn’t effect the taste in any way! Can you freeze Homemade Chicken pot pie? YES! I recommend baking the entire thing and then putting it in the freezer. To reheat, simply cover the frozen healthy chicken pot pie with foil and warm it in the oven at 375 degrees F for 35-45 minutes. Freeze the filling. Or you can just make a huge batch of filling and freeze it in a glass baking dish or a disposable aluminum baking dish. Then all you’d need to do is warm the filling until it reaches room temperature (covered in the oven) and then add the biscuits and bake as directed. Is Chicken pot pie healthy? I’d say it depends on the recipe! If it’s a variety loaded with butter, flour, etc. then I would say it might be better for the soul than the body! 😉 If it’s a store bought variety, then you need to check the ingredients list very well to ensure there are no chemicals, dyes or preservatives. 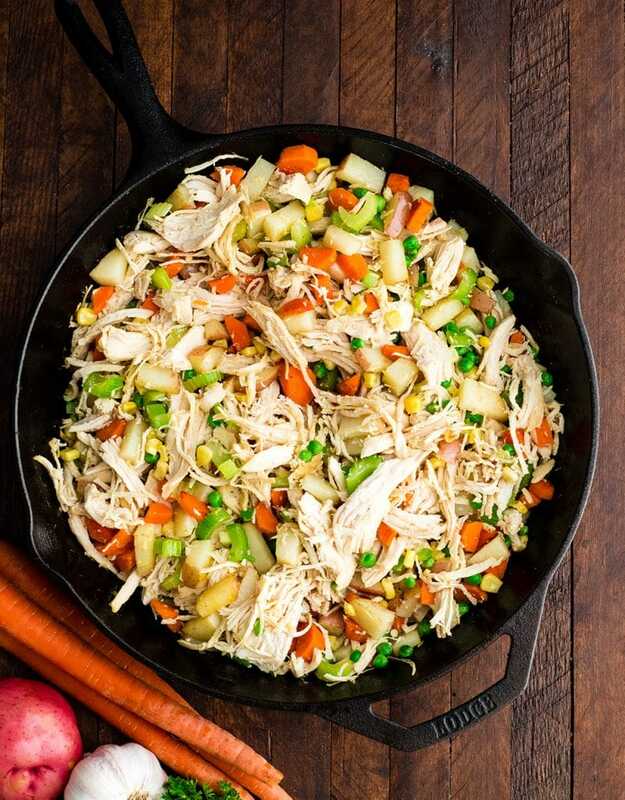 This recipe for healthy chicken pot pie from scratch IS healthy! 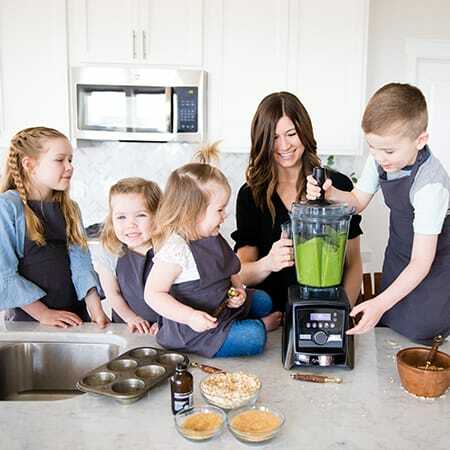 It’s loaded with veggies, protein, whole grain flour, vitamin A, vitamin C, calcium and iron! So much to love and still super cozy and satisfying! Ok ya’ll, let’s dish about the ingredients in this fabulous chicken pot pie! Cooked & Shredded Chicken Breasts. I usually don’t have this on hand, so I cook and shred it myself! Simply cover chicken breasts in chicken broth and boil, covered for about 20-25 minutes or until easily shredded. Remember, the thicker your chicken breasts are, the longer they will need to cook. You can also use leftover rotisserie chicken that you shred on your own (SO GOOD)! Red Potatoes. Any type of potato works well in this recipe. I recommend red or Yukon gold. I like to leave the skin on for it’s nutritional value and texture, but if you’d prefer you can peel the potatoes! Celery, Carrots, Peas and Corn. I personally think these are all is a key veggies in chicken pot pie. However if you don’t love any of them feel free to omit or substitute with more of your favorite. I kept it pretty basic and classic in this chicken pot pie recipe. But you can go wild and add bell peppers, mushrooms, parsnip, etc. etc. etc. 2% Milk. Any milk percentage works in this recipe. Remember, the higher the fat content, the creamier and more flavorful the sauce will be. All-purpose flour. For a gluten-free version, substitute all-purpose gluten-free flour. 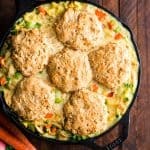 Or if you are looking for a gluten-free version, check out this Gluten-Free Chicken Pot Pie with a pie crust instead of biscuits! Water/chicken bouillon. 2 cups of chicken stock can be used in place of the water + chicken bouillon. I personally LOVE the flavor of bouillon significantly more than regular broth! All-purpose flour. For a gluten-free version, substitute all-purpose gluten-free flour. Whole wheat flour. you can sub all-purpose flour for whole wheat flour if you’d prefer a more traditional biscuit. Sour Cream. I have used both sour cream and plain Greek yogurt with excellent results! Milk. Any milk percentage works in this recipe. Remember, the higher the fat content, the creamier and more flavorful the sauce will be. Shop Chicken Pot Pie Making Essentials! In a small bowl, whisk together flour, onion powder, garlic powder, garlic salt and pepper. Add milk and whisk until combined, set aside. In a 4-quart pan over medium heat, boil water. Add chicken bouillon and whisk until dissolved. Add milk/dry ingredient mixture to boiling water/bouillon. Cook over medium heat, stirring constantly, until thick (about 3 minutes). Grease a deep dish 9” pie plate or cast iron skillet. In a saucepan, sauté potatoes, and garlic for 5-10 minutes, or until potatoes just begin to brown. Add onion, celery and carrots and sauté until soft (about 10 minutes). Add peas, corn and shredded chicken and stir to combine. Pour the sauce into the pan with the filling mixture and stir to combine. Pour the mixture into the prepared 9” pie plate. In a large bowl combine whole wheat flour, all-purpose flour, baking soda, baking powder, sugar and salt, stir to combine. Cut the butter into small pieces than add it to the dry ingredients using a pastry cutter or your hands until you have coarse crumbs. Add the sour cream, milk and egg and stir to combine. The mixture will be a a bit tacky to the touch. That’s good! Divide the batter into 6 pieces, and form each piece into a flat round circle. Gently place biscuits on top of the filling in pie dish. 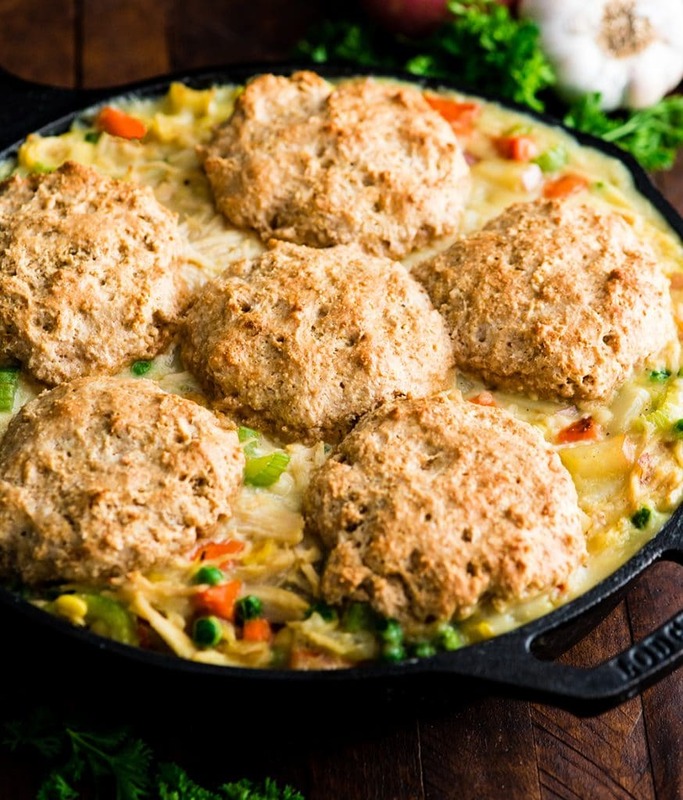 Bake the chicken pot pie on the lower rack in the preheated oven for 30 to 35 minutes, until the biscuits are golden brown and the filling is bubbly. Once the healthy chicken pot pie has finished baking, remove it from the oven and let it cool for 10 minutes before serving. Do you think I could cut this recipe in half and bake it in a smaller dish? Only 2 of us at home. Hello! I made this recipe, but I found the biscuit mixture to be runny! Is this okay? The mixture should not be runny. See the photo of the unbaked pot pie in the post for reference! If it’s runny I’d add a touch more flour! This looks amazing and plan on trying on my next day off! Healthier versions of comfort food is definitely appreciated this time of the year! So so yummy! I don’t feel bad having comfort food when it’s this healthy! Thanks for a new staple recipe! Thank you Jennifer! This is one of our favorites! I was searching for a healthier chicken pot pie without tons of butter, this was delicious. Loved the crust! What did you use to saute` veggies? olive oil? canola oil? or butter? Also, potatoes and carrots were not quite done. I will need to cook longer next time. Hey Shari! I usually use olive oil to sauté the veggies! I’m so glad you enjoyed it! Even though this took quite a bit longer to put together than stated in the recipe, the end result was probably the BEST chicken pot pie I’ve ever had! Absolutely delicious!